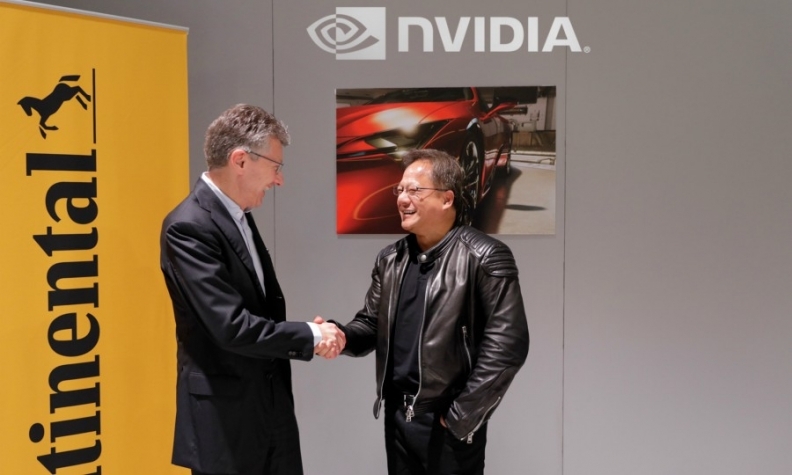 Continental CEO Elmar Degenhart (left) and Nvidia founder and CEO Jensen Huang shake hands following an announcement to develop a joint self-driving system. SAN FRANCISCO -- German supplier Continental and Nvidia have teamed up to develop a self-driving system based on the U.S. chipmaker's artificial intelligence platform, underscoring the need for collaboration in the fast-moving industry. The announcement is the latest of many collaborations for Nvidia, whose Drive platform that helps enable autonomous driving is ubiquitous in the industry. The Silicon Valley-based company known for its graphics chips said last month that 320 companies involved in the development of self-driving cars use Nvidia Drive. Automakers and their suppliers have sought alliances to share the high costs of developing self-driving cars, which are expected to start appearing in the marketplace over the next few years as so-called robotaxis at first. Still, experts expect the transition from human-driven to automated cars could take a decade or more. Nvidia and Continental said their self-driving vehicle system, which will integrate a range of Continental sensors, will be introduced in 2021, after a period of collaboration between engineering teams from both companies. The companies did not disclose financial terms for the partnership. At CES in Las Vegas last month, Nvidia announced partnerships with Uber and Volkswagen Group. The company also works with electric vehicle maker Tesla and China's Baidu. Continental - which also works on self-driving with Baidu - is part of a separate consortium of automakers and suppliers working together to develop full autonomous driving systems. Led by BMW, that alliance also brings together Fiat Chrysler Automobiles, Intel and Intel's vision systems subsidiary Mobileye, with Continental handling integration of components and software. U.S. auto supplier Aptiv is also part of the alliance.